Mexico | Strike of Lightning! Mexican drug lord Joaquín “El Chapo” Guzman has a lot of enemies: the Mexican government, the Drug Enforcement Administration, Donald Trump. But now the world’s most powerful drug trafficker is taking one what is arguably the world’s most feared organization, ISIS. Chapo’s anger toward the radical jihadist group does not stem from some sense of altruism for the victims of the recent attacks in Paris or San Bernardino, but instead from concerns about his bottom line after ISIS destroyed several of his Sinaloa Cartel’s drug shipments moving through the Middle East. In a harshly worded email to ISIS, which was leaked by the website Cartel Blog, Guzmán sent a stark warning to ISIS leader Abu Bakr Al Baghdadi about messing with the cartel’s business. The Sinaloa Cartel is considered the world’s largest drug trafficking organization, with operations running throughout the Americas, Europe, Africa, Australia and Asia. In the Middle East, the cartel has become a major provider of cocaine, ecstasy and other so-called party drugs to oil-rich princes and businessmen throughout the region. Islamic State fighters, however, abhor the use of drugs and have systemically been destroying any cartel shipments they get their hands on. While the group is prolific on social media and in their video output, ISIS has so far not responded to the threats from Guzmán. In his letter, Guzmán also hints that if he succeeds in destroying the terrorist group then he should be given immunity from prosecution. Guzmán made a highly-publicized escape earlier this year from a maximum security prison in Mexico, where he was awaiting trial on drug trafficking charges. “It would be ironic that the group who ends up taking out ISIS is El Chapo’s drug cartel!” Guzmán reportedly wrote. “They seem up to the task and it could be worth giving immunity to this guy in exchange for him and his boys taking out ISIS once and for all! The authorities of California Public Health investigating a disease that is transmitted by food that has affected 73 people and has been linked with mangoes infected with salmonella. Authorities said Tuesday they are still investigating what caused the outbreak of salmonella cases in California Braenderup. ‘re trying to identify what types of mango or sources could be related to the disease. Officials of the Department of Public Health of California reported that 67% of patients who have interviewed reported eating mangoes. They also said that the fruit came from several vendors, including one in Mexico. Agency Canadian Food Inspection also recently reported illnesses resulting from the same bacterial strain. Authorities in California said they are working with the Centers for Disease Control and Prevention and the Food and Drug Administration of the United States as well as Canada’s health agencies, to locate the cause. Mothers are the main promoters of bullying, a problem that was strengthened by the widespread violence affecting the country, according to a study conducted as part of the master’s degree programme in Human Development at the Universidad Iberoamericana. The research on “Bullying: Workshop focused on the mothers, middle-class and upper high class”, prepared by the student Gabriela Montezuma, shows that mothers exert passive aggressiveness with phrases like “do not get into trouble,” “stay quietly” or “Do not say anything,” when they should convey assertiveness to defend and define their own views respecting other’s opinion. He said that according to recent assessments of the National Commission of Human Rights (CNDH), bullying affects four out of 10 children aged between six and 12 years, and a legislative study places Mexico in the first place internationally by the number of cases of bullying in secondary schools. Moctezuma notes that one should participate in bullying the bully, the victim and many observers who unknowingly become the main promoters of violence remain silent and did not report acts of aggression against parents or teachers, or stop the crime when it occurs, he said. Gabriela Montezuma a student in the MA in Human Development and Academic Department of Economics will present the results of this analysis in late 2012.
after spending 18 years in the capital country subject to detailed studies of physical anthropology, officials said. The National Institute of Anthropology and History (INAH) explained in a statement that the woman, who was believed to be Tzakbu Ajawm, the wife of Pakal II, ruler of Palenque between 615 and 684 AD, was returned to Palenque in the company of the other two bodies, slaughtered and buried next to her. These correspond to a woman between 20 and 30, and a child who was between 7 and 12 years at the time of his death and burial, which occurred in 672. The INAH has a policy of keeping at the site all the materials found so that no collections can be dispersed to other museums. On June 15 the remains, were carefully placed in seven boxes, and were returned to Palenque “in the holds of receipt” of the archaeological zone in an area where humidity and temperature are controlled. The statement specifies that for the moment “is not the Red Queen may return to his burial chamber, inside the Temple XIII, due to excess moisture making the building” located next to the Temple of the Inscriptions. 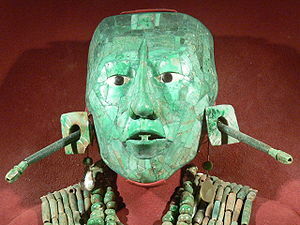 The INAH noted that “the last physical anthropology studies determined that the remains of the Red Queen could correspond to the wife of the Mayan ruler Pakal II, and his mother, as was believed during the early years of the discovery of his tomb” . Genetic studies performed DNA “confirmed that there was no relationship between the Red Queen and Pakal II”, who was ruler of Palenque. The Red Queen had a high status and should play a key role within the royal lineage, as presumed from its discovery in 1994 in the so-called Temple of the Inscriptions, where he found the tomb of King Pakal. The name comes from the Red Queen malachite mask covering his skull was covered by a layer of cinnabar, a red mineral, three inches thick. The woman must be between 40 and 45, measured five feet, and was suffering from osteoporosis, according to studies that were performed. The city of Palenque, located in the southern Mexican state of Chiapas, near Tabasco, has a crucial role in the study of history and religion of the Mayas by the value of the archaeological remains found in it.